Abutilon is a family of plants more commonly known as flowering maple. They are tender perennial shrubs or small trees that produce spring, summer and fall blooms in hues of yellow, orange, terra-cotta rose and white. Called flowering maple for the shape of its foliage, abutilon flowers actually resemble hibiscus blooms and, in fact, the plants are related. Hardy in USDA Zones 8 through 10, with ideal conditions abutilon can successfully be grown indoors in cooler climates. Cut back the stems to produce a more voluminous and compact growth habit for your abutilon. Make cuts between 2 and 12 inches as desired for your plant's shape and size. 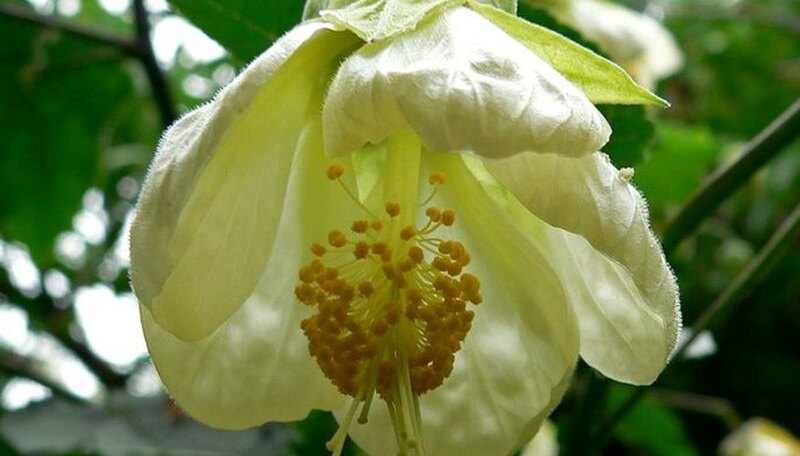 Spread the cuts evenly around the shrub to maintain a symmetrical and balanced shape to your abutilon. This light pruning can safely be done in the early spring and throughout the growing season.The stem cuttings can easily be rooted in nursery pots and grown as seedlings or given to fellow gardeners as gifts. Pinch prune your abutilon throughout the growing season promote new branch growth. Use your fingers to pinch off the new growth tips just above the spot you want to see new branching shoots. Prune any branches that cross or abrade one another or appear damaged or diseased. Deadhead fading blooms quickly to encourage new flower production. Hard prune your abutilon in the early spring after the last hard frost and before bloom. Cut back leggy and overgrown plants down to a foot or two of branching as needed to restore the desired shape and interior architecture of the shrub. Spring bloom for that season will obviously be affected but the plant will leaf out by summer to some degree and will produce buds and blooms the following spring.